Sorry! Camp is filled and registration is closed. As result of obligations for managing the 14th California State University Symposium on Teaching in 2011, the next Boot Camp for Profs® is scheduled for June 17 - 22, 2012 at this same location. We discovered the Timberline Campus of Colorado Mountain Colleges about ten years ago, and have never found a better site. The facilities are perfect, the staff is very professional and knows our needs and even the diet preferences of professors. We now consider Leadville our "home" for the program. The content and we instructors (hopefully!) improve a bit each year. At the end of this week-long program, we don't want to leave—neither will you. We expect the event for 2010 to be better than ever. For all questions or information, contact the director at enuhfer@earthlink.net or by personal cell phone at 208 241-5029. Boot Camp in its middle years increasingly concentrated on the concept of one's personal "teaching system" in the context of what fits best for each of us and for our careers within our specific institutions. A "teaching system" addresses practice by building upon a few central, unifying concepts. These concepts are developed and expressed within a document that can be considered as a blueprint for practice—a "teaching philosophy." This document addresses: (1) our core aspirations and values that we become aware of through self introspection in which we reflect on our affective reasons for choosing higher education as a profession: personal growth, satisfaction and professional improvement; (2) content learning outcomes we want for students; (3) teaching in the forms of making informed choices about pedagogical approaches that match our learning outcomes and will produce the best kinds of experiences to help students to learn; (4) thinking in terms of addressing the most appropriate stages of intellectual and ethical development; (5) rubrics that will insure that high level challenges of critical thinking will be met by high level responses from students and (6) student metacognition, about their learning and their learning process, which is the correlative to our own introspection. Over time, we found that this integrated approach was more effective in producing permanent career success than were any series of workshops. The "Camp" is small. We prefer to work with a group of about twenty faculty. Other distinguishing characteristics for "Boot camp 2010" include: (1) workshops that result in attendants preparing actual materials for their own classes on - site, (2) receipt of a personal library of acclaimed resource books and (3) an emphasis on how to become increasingly successful in each passing future year. In addition to teaching, emphasis is also given to more rarely considered aspects of career success such as becoming a better colleague and becoming a better advisor for students. The camp experience will introduce you to a body of literature that is seldom encountered within academic disciplines. It is immensely useful, and familiarity with it is gradually becoming indispensable to success in today's universities. Materials you will receive in the 2010 "BOOT CAMP for PROFS®" include a very thick and useful set of working notes plus nine books—likely those below. Sections of these will be used during the week, and they will serve you for many years as good reference sources. If you were to found your own office of faculty development, these would constitute a solid set of resources. Millis, B. (Ed. 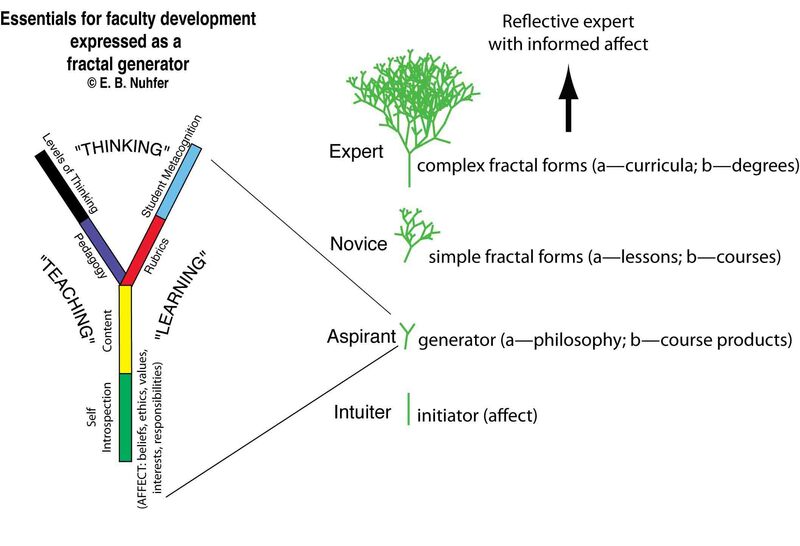 ), 2010, Cooperative Learning in Higher Education: Across the Disciplines, Across the Academy. Sterling, VA: Stylus Press..
Davis, Barbara, 2010, Tools for Teaching (2nd ed. ): San Francisco, Jossey - Bass. Dunlosky, J and Metcalfe, J. (2009) Metacognition. Los Angeles, Sage. Fink, Dee, 2003, Creating Significant Learning Experiences: An Integrated Approach to Designing College Courses San Francisco, Jossey - Bass. Gareis, S. and Grant, L., 2008, Teacher-made Assessments. Larchmont, NY. Eye on Education. *Jones, Thomas B., 2005, The Missing Professor: Sterling, VA, Stylus, 144 p.
King, P. M., and Kitchener, K. S., 1994, Developing Reflective Judgment: San Francisco, Jossey - Bass, 323 p.
Nuhfer, E. B., and others, 2006, A Handbook for Student Management Teams: Camarillo, CA, California State University of the Channel Islands, 60 p.
Stevens, D. D., and Levi, A. J., 2005, Introduction to Rubrics: Sterling, VA: Stylus, 169p. (1) Five copies of a one - page (two is a maximum!) teaching philosophy. Two of these copies should be printed without your name or that of your institution on it. For now, it is important to get a snapshot of your philosophy as it exists today. Thus it is best to produce that without consulting any books or self-help guides as you write this. You can consider this as very preliminary and just a starting point. You will refine this document throughout the week. You have already received an introspection exercise that can guide you with prompts about "what is" at the moment. Margie Krest has created some helpful documents for writing these teaching philosophy statements that will be in your notes and can be used later. (1a) When you have completed your philosophy, go to "WORDLE" and create a piece of Wordle art for your philosophy. Print and bring that to camp. The $1300 fee includes the workshops, materials, lodging, and all meals but one. Materials furnished include texts, bound notes, on - site Xeroxing and computer disks. Meals include breakfast/brunches and lunches Sunday - through - Saturday, a get - acquainted barbecue Sunday evening, and a banquet on the final Friday evening. Not included are Wednesday's supper (on your own) and the cost of Wednesday afternoon's recreational activity that you choose such as white water rafting or horseback riding. If your institution is paying for your registration for individuals or teams from your campus, provide the information in this web page to the persons responsible for handling that paperwork. They can choose to pay out of this fiscal year's money before June 30 or pay after camp out of next year's after July 1. We do ask this year that arrangements for all payments be clarified by May 30. June 19, Saturday - dorms open for evening arrivals as needed. Call 208 241 5029 for very late arrival. Camp Director will meet you at the door at whatever hour you arrive. (a) 1 - page teaching philosophy written as a narrative plus a WORDLE <http://www.wordle.net/create> constructed from your philosophy. (c) Your completed introspection exercise. 9:30 - 11:00--"No one gets in to see the Wizard - not no how, not no way!" Ed Nuhfer and Boot Camp staff. Employs an active introduction to the practiced philosophy of the Camp. 2:30 - 5:15 with 3:30-3:50 Snack Break Our Fractal Lives as College Teachers — A Guided Reflection on the Stages of Our Developing Lives as Professionals— James Rhem and Ed Nuhfer. This session integrates "The Teacher in the Movies" presentation by James Rhem, which has been performed as conference keynotes and campus presentations all over the country with workshops "Harnessing the Power of the Affective Domain in the Classroom" and "Educating in Fractal Patterns" likewise delivered at many conferences and campuses by members of our Camp staff. Morning Yoga Class 6:30 – 7:30 a.m. with Margie Krest. Optional, voluntary, and totally wonderful. 2:00 - 3:20 Learning through Writing - Your Teaching Philosophy – Margie Krest & staff. (b) your written responses to your group members' philosophy statements. 3:40 – 4:50 Mystery Theatre—Opening Act The First Day of Class —Tom Jones. Bring with you The Missing Professor. Missing Professor author Tom Jones is available to discuss other cases during the week. We often have this done at selected meals at a designated table. 6:45 Optional Evening Workshop — How We Think About Change Through Time: Big Understanding Comes from Little Things—Ed Nuhfer. A teaching philosophy enacted: demonstration of critical parts of a deep learning exercise for a freshman geology class. Morning Yoga Class 6:30 – 7:30 a.m. with Margie Krest. Optional, voluntary, and totally wonderful, and likely very needed by now. Afternoon - Evening RECREATION Options - Horseback riding, biking, hiking white water rafting, are a few of many possible options. You may want to use this for your own personal R & R break - your free choice! Costs of recreational events are borne out - of - pocket by participants, and rates for each option will be furnished on opening day of camp. Dinner - out on your own in Leadville or elsewhere, possibly with your recreational group, but again, your personal option. Morning Yoga Class 6:30 – 7:30 a.m. with Margie Krest. BREAKFAST 7:00 - 8:00 A.M. (Note—late risers can still get full service by arriving by 7:45—no one will push you out from your table at 8:00. Convene at 9:00 a.m. 9:00 - 12:00 What Determines Success: How Smart We Are or How Smart We Work? — Steve Fleisher A workshop on what we and our students should know about metacognition. 2:30 - 3:30 Three Book Discussion Groups – Select your choice of Leamnson, R., 1999, Thinking About Teaching and Learning facilitated by Ed Nuhfer or Bain, K., 2004, What the Best College Teachers Do, facilitated by Tom Jones or Zander and Zander, 2002, The Art of Possibility, facilitated by Steve Fleisher. Our Last Morning Yoga Class 6:30 – 7:30 a.m. with Margie Krest. 2:30 - 3:30 Your Sophisticated Teaching Philosophy: a Summary Tuneup of Your Evolving Philosophy—Margie Krest and Boot Camp Staff. Assignment: Before the banquet, construct and print a second "WORDLE" of your philosophy as it stands at the end of the day, collect your first WORDLE, and bring both to the banquet. 6:30 BANQUET - BOOT CAMP CELEBRATION! - Please Inform us whether you are leaving for home at the end of the banquet or if you are staying overnight in the dorms. Most adjourn to town for one final party after the banquet. Those having us ship boxes of books home for you: have boxes taped and addressed (both to and from) and place in black Suzuki SUV parked by the dorm entrance tonight or by 9:00 a.m. Saturday morning. June 26, Saturday — No sessions or meals - campus closes down. Campers staying Friday night may wish to gather for final goodbyes at a breakfast spot of choice in Leadville before heading home. 2010 BOOT CAMP INSTRUCTORS AND FACILITATORS include faculty and faculty developers from diverse institutions (U. S. Air Force Academy, California State University — Channel Islands, University of Colorado, University of Texas at San Antonio), the author of the acclaimed The Missing Professor, and the Editor & Founder of "National Teaching and Learning Forum," which is a uniquely progressive established publication frequently cited in primary literature. Instructors are selected based on success in their disciplines as teachers and scholars, and their personal passion and dedication to the support of college teachers. The instructors are veterans of having done the program together for years, and the effects of this will be obvious to attendants. When not in the role of managers of a session, they are participants with every other attendant. STEVEN FLEISHER is a Lecturer in the Psychology Program at California State University, Channel Islands. In his first life, he worked as a roofer and carpenter, and returning to school in 1988, completed his Bachelors and Masters in Counseling at California State University, Los Angeles. Following his loves in psychology and teaching, Steve enrolled in the Ph.D. Program in Education at UC Riverside, and is published with the Council of Chief State School Officers on standards and assessment, and the California Council on Science and Technology on education and industry. He then completed the Ph.D. in Clinical Psychology at California Graduate Institute, Los Angeles, formalizing his research in psychology and education. Steve’s research on self-regulation in academic learning is published in several issues of “Academic Exchange Quarterly” and recently with “National Teaching and Learning Forum." He has served as the director of research for Power Teachers of America and is an increasingly frequent presenter at POD, Lilly, CSU Teaching Symposia and the Geological Society of America, where he was recently an invited keynote speaker on self-regulated learning at their National Meeting in Portland, OR. Mitch has won several teaching awards, including the 1992 CASE (Council for the Advancement and Support of Education) Colorado Professor of the Year Award in 1992, and APA’s Division 2 Excellence in Teaching Award in 1995. He has published more than 10 book chapters and over 50 articles in journals ranging from the Professional Psychology: Research and Practice to the Journal of Polymorphous Perversity. His major research area is professional ethics. He is the co-author (with Sharon K. Anderson) of a new text on ethics in psychotherapy (Ethics for Psychotherapists and Counselors: A Proactive Approach) from Wiley-Blackwell. Mitch is also a trumpet player and plays jazz and blues in the Denver area. THOMAS JONES received his B.A. (1964) from the University of Minnesota and received a Woodrow Wilson Fellowship for graduate study in history. He completed his Ph.D. from Cornell University in 1968. He has taught at Northern Illinois University, Metropolitan State University (St. Paul-Minneapolis), Rockhurst University, and Maple Woods Community College. His publications include articles on American foreign policy, economic history, segregation, film and history, the humanities, college teaching, and adult education. He helped found and direct teaching centers at Metropolitan State and Rockhurst University. He created the well-known case book The Missing Professor, and is co-author of Promoting Active Learning: Strategies for the College Classroom (1993) and has recently completed a new book, Deadly Professors, which 2010 Campers will be able to sample, even though its print date is set for July. MARGIE KREST, independent consultant, has been the primary instructor in drafting teaching philosophies at Boot Camp for over ten years. She served as Senior Instructor in the Department of Environmental, Population and Organismic Biology at the University of Colorado at Boulder, teaching graduate and undergraduate courses in technical writing. She publishes articles in The Journal of Teaching Writing, English Journal, The American Biology Teacher, National Teaching and Learning Forum, and the Journal of College Science Teaching and delivers workshops on varied kinds of writing, especially writing of teaching philosophies. She is a certified Hatha Yoga Teacher and serves as the Boot Camp's yoga instructor. EDWARD NUHFER is California State University at Channel Islands' Director of the Center for Faculty Development and the trademark owner of Boot Camp for Profs®. Ed is a geologist by training, holds several teaching awards, awards in geology from the American Institute of Professional Geologists, and faculty develpment awards from the Professional and Organizational Developmental Network (POD). He developed interest in science education as a Shell Merit Fellow at Stanford University in the summer of 1970, and embraced faculty development as a major career interest in 1988 while on sabbatical in Colorado. He describes himself as "a perpetual student and incurable teacher made slightly crazed and dangerous by fractals on the brain." After his sabbatical, he founded and directed the Teaching Excellence Center at UW - Platteville where he created Student Management Teams as a faculty development tool. In 1992, Ed joined CU-Denver as their first Director of Teaching Effectiveness. There he founded Boot Camp for Profs in 1993 with other faculty, invented knowledge surveys, and produced the one-page newsletter, "Nutshell Notes" (found in your bound notes.) Ed spent another five years at Idaho State University as Director of their Center for Teaching and Learning before being recruited to "the land of eternal spring" in Camarillo, CA, which may not quite be heaven, but it's perhaps as close as it gets for his interests. Ed is a regular columnist for "National Teaching and Learning Forum" and serves on several editorial and reviewer boards. His favorite work week is the Boot Camp week spent with guidance of caring professors, mentors, and colleagues. Off-work, Ed can be found days on a hiking trail, a bicycle, or with friends Steve and Carol Fleisher on their vintage motorcycles along the Pacific Coast Highway.